I provide my minding services from my home in Aldershot. Our home is a happy, friendly, secure, smoke and pet free environment where children will feel like it's a home from home. My husband is also registered and has been minding with me for the last 13 years. He is currently working outside of the home in a different profession. We are Ofsted registered, a member of PACEY, NVQ Level 3 qualified, Paediatric First Aid qualified, and am fully trained in Safeguarding Children. We have a 17 year old daughter, who is also DBS checked, and I currently look after children in various age groups. The youngest child that we have had in our setting was 3 months, who left us when she was five years old. We do believe in continuity of care, which comes from an increasingly open, honest and communicative relationship with our parents, which works in the best interests of the children we look after. To this end, we provide a secure, stable and flexible environment, whilst having lots of fun, and pride ourselves on quality of care. Children benefit from our childcare setting by having established routines, whilst trying to be flexible for parents and children alike. Working in accordance with the EYFS framework and the National Guidelines, we use a system called BabysDays to record your child's time with us. This will record daily diaries, attendance, photographs, observations, learning journals, and so much more information about your child, and the setting, which you can access at any time. 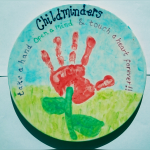 I, Seema, have worked as a childminder since April 2005, and my husband Andy joined me in July 2006. I have also worked, on occasion, at our local SureStart / Early Years Centre. My husband had, previous to childcare, operated a special needs transport contract for Hampshire County Council. NVQ Level 3 in Children's Care Learning and Development. We currently have vacancies for all age groups from 0 to 8. Please enquire directly. We can accommodate pre-school drop-offs and collections dependant on timings and the days. We would also consider Park Primary School drop-offs and collections. Our charges are £5 per hour for full-time care and £5.50 per hour for part-time care. We calculate an average cost over the whole year to avoid large bills for those parents that require holiday cover as April, July, August and December can prove to be very expensive.This can also be an advantage to those parents who receive assistance for their childcare costs, as variations by £10/week or £40/month require notification, so parents would constantly need to contact the HMRC Tax Credit helpline. We invoice for the 1st of each calendar month and payment is required in advance. We also accept payment currently through Care4, ComputerShare and EdenRed voucher schemes, and are are happy to register with other schemes that are available. Below are the latest reviews for Seema Fox. Please note that reviews represent the subjective opinions of other Childcare.co.uk users and not of Childcare.co.uk. Parents must carry out their own checks and references on childcare providers to ensure that they are completely happy before enaging in the use of their services. This year my son will have been with Andy & Seema Fox for 10 years - that says an awful lot about the trust and mutual respect we have for each other as parents and childminders. I took to Seema & Andy immediately I met them after a recommendation from my previous childminder who was unable to take on my then 6 month old boy as well as his 5 yr old sister. My daughter and son both settled in quickly and have made lots of friends along the way. My children have been treated in some ways better than I can as a working parent. I have never had any cause for concern. I was kept up to date with any progress while my son was a baby, which is important because we could share the joy at him learning new skills and developing as a good citizen. I would wholeheartedly recommend Fox's Cubs for your childcare needs if you are looking for a home environment, with good family values and bundles of love and cuddles. Ten years of experience, my children have benefited so much I could write a book! Thank you - we have enjoyed helping and watching them grow into happy, confident, well-rounded individuals. They have both been a key part of our setting, and we are very fond of them both. Well, what can I say other than I'm so pleased Seema & Andy had space for our little man, Seth. He's not even been there a full week (yes quick to write a review), however, our Little Man has loved every minute of being there so far. He's come home every night a happy little man after spending the day with Seema and Andy. He has settled so quickly with them it's fantastic and so settling for us both, especially when we're relatively new to the area. Although we did have one grumpy child on Saturday when he realised that he was with Mummy and Daddy all day! I love the fact that time is taken to write how Seth has got on on a daily basis, and how his day has gone and what he's done (naps, snacks, meals and play times). Seema and Andy are a fantastic couple and they really encourage all children in their care to explore their imaginations no matter what age they are and this is evident when walking into the garden/home from all the activities the children have to choose from and the freedom they have to do it in. As much as I don't like to wish time away, I can see Seth developing brilliantly here before he goes to school and the time spent here is really go to show when he does. such a shame to be leaving! I cannot recommend enough Seema and her husband Andy as childminders. My little boy settled in fantastically and has really enjoyed his time there. The outdoor space so that he has been able to play out so often in such a secure safe environment has proved invaluable for being able to get him asleep at a decent time and I would not hesitate to recommend this setting to anyone. My two children have been coming to Fox's Cubs for 5 years now. They have seen my son grow from a 6 month baby to a confident 5 year old going into Yr1. My daughter has been with Seema and Andy since Infant School and has just started Secondary school! They have cared for both children, my son full-time until he started school, and my daughter after school, holiday time, inset days, and even taking them to swimming lessons when I haven't been able to get there - what a service! We have always been informed on the childrens' progress, good behaviour, bad behaviour, etc and for me as a fulltime working mum this means I can keep on top of things that my children are doing. The children regularly go to the park on sunny days to expend energy, have healthy snacks and participate in games. They provide an excellent service while I and my husband are working, and I would recommend them whole-heartedly.